Rings Silver & Gold / page 4. Ring silver & gold. ﻿Page 1.﻿ Page 2. Page 3. 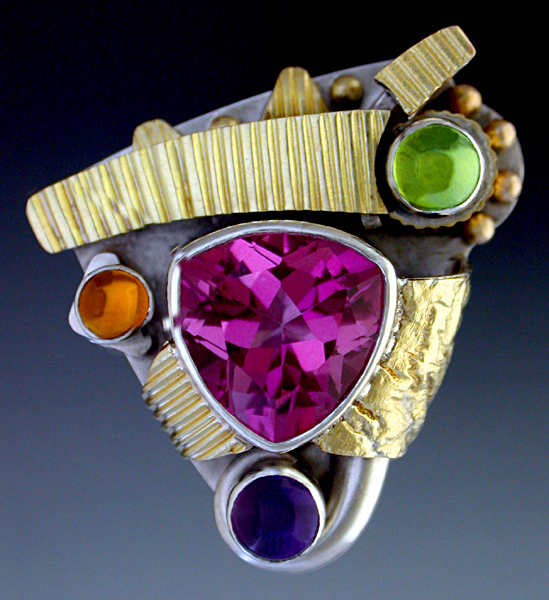 Materials: Streling Silver and 14K Gold set with Pink topaz, Amethyst, Peridot and citrine. 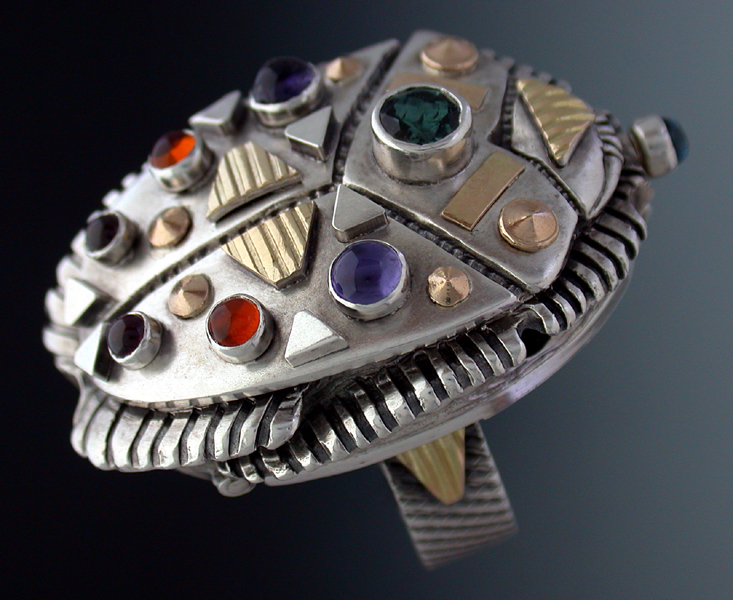 Materials: Sterling Silver and 14k Gold set with , Blue Topaz, Peridot, Garnet, Amethyst, and Iolite. 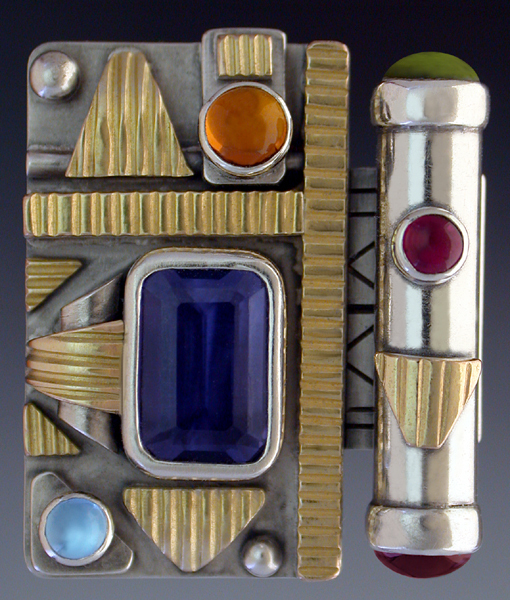 Dimensions: 1" 1/4 x 1" 1/4 x 7/16"
Materials: Sterling Silver and 14K Gold set with Amethyst, Citrine, Tourmaline, Ruby, Blue Topaz, Peridots and Iolites. 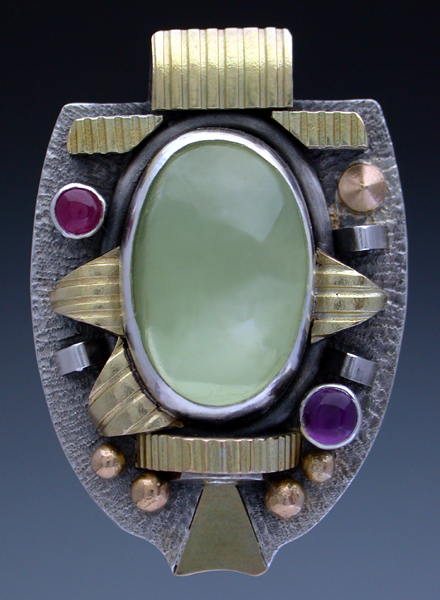 Materials: Sterling Silver and 14k Gold set with , Peridot, Amethyst, Iolites, Citrine and Garnet. 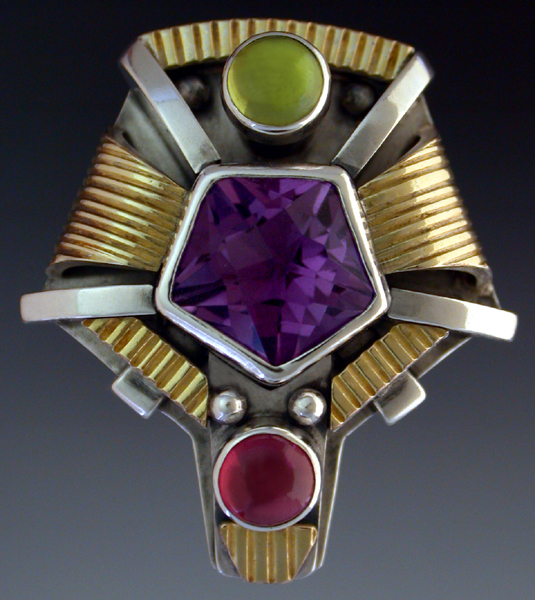 Materials: Sterling Silver and 14k Gold set with ,Amethyst, Peridot and Garnet. 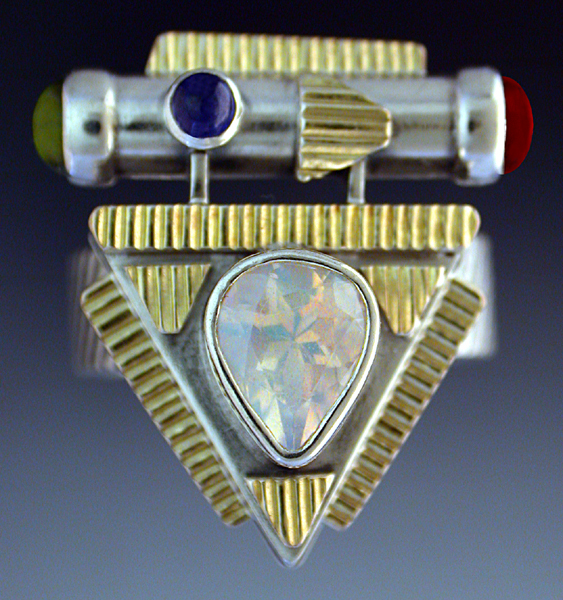 Dimensions: 15/16” x 15/16" x 3/8"
Materials: Sterling Silver and 14K Gold set with Rainbow Moonstone, Peridot, Garnet and Iolite. 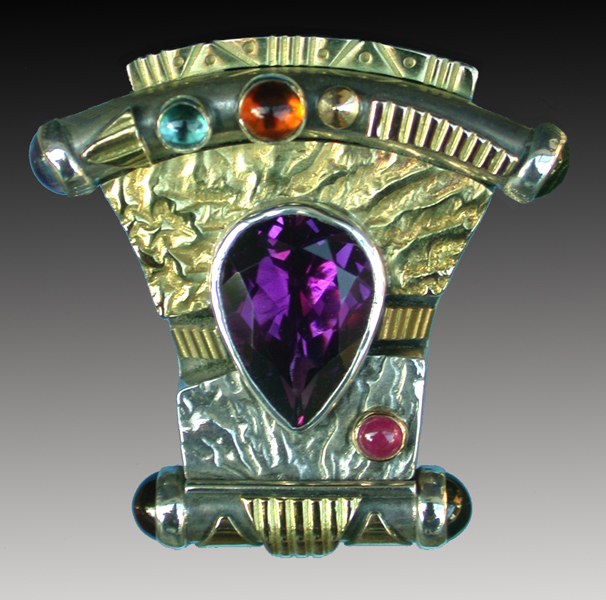 Dimensions: 1" 1/16 x 7/8 x 3/8"
Materials: Sterling Silver and 14K Gold set with Pink Topaz, Amethyst, Peridot and Citrine. 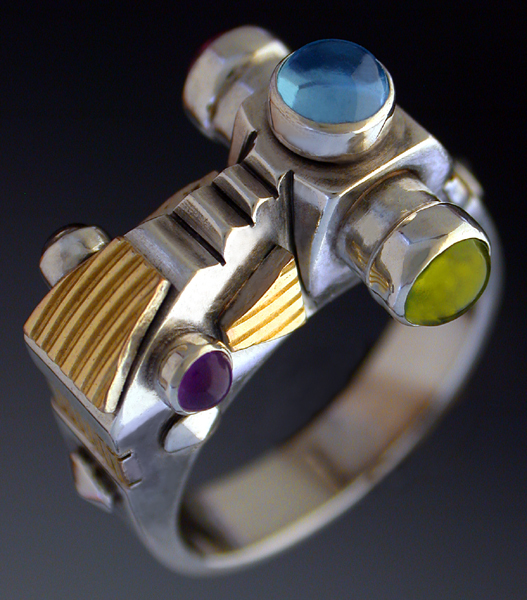 Materials: Sterling Silver and 14k Gold set with , Iolite , Citrine, Peridot, Blue Topaz and Garnets. 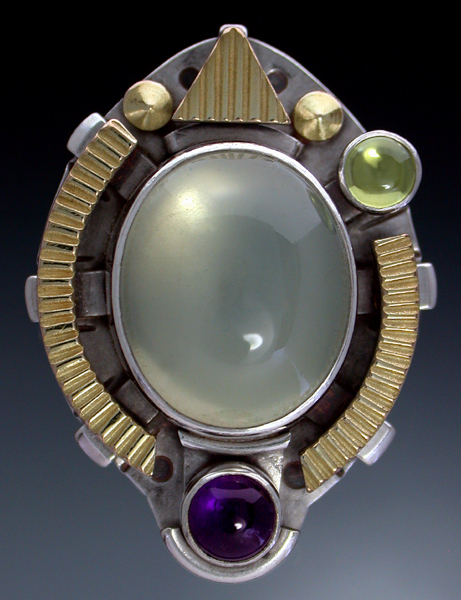 Materials: Sterling Silver and 14K Gold set with Green Moonstone, Amethyst and Peridot. 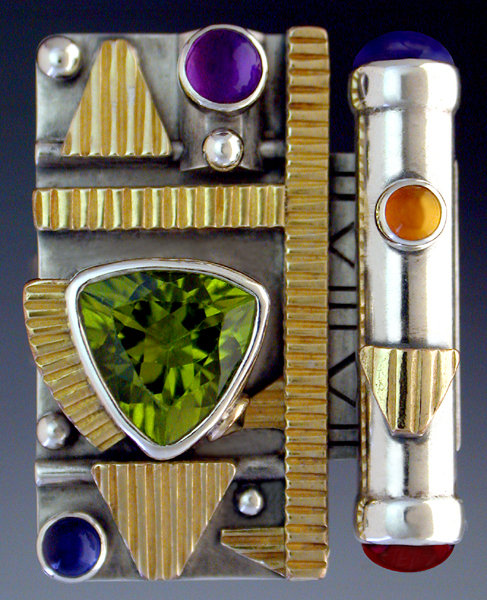 Dimensions: 1" 1/2 x 1" 1/16 x 9/16"
Materials: Sterling Silver and 14K Gold set with Green Tourmaline, Citrines and Garnets. Description: This ring comes apart and becomes 2 rings and a pendant. The picture on the left is the top part of the ring that once removed can be wore as a pendant. The bottom picture is what is left of the ring after to top part of the ring has been remove. 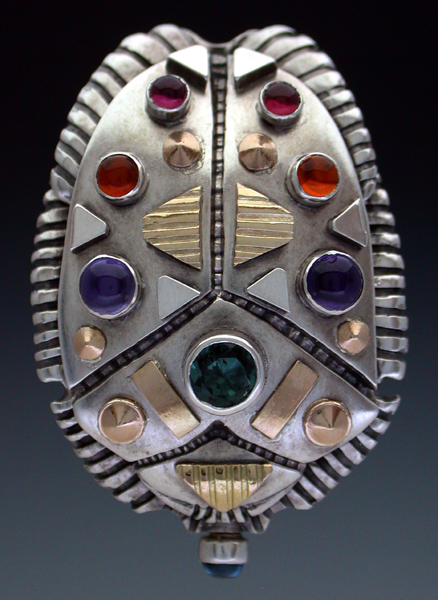 The picture on the left is the inside ring of the Scarab ring. 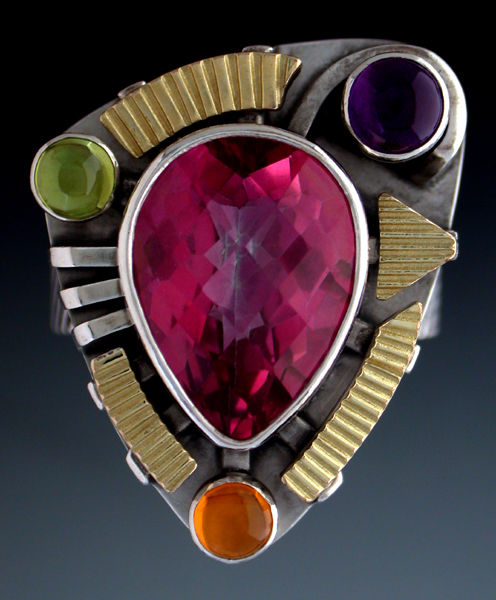 .This ring is the ring after to top pendant part of the ring has been remove.